"Living on the moon . . . Whatever were we thinking? . . . It seems so silly now." The lunar colony is slowly winding down, like a small town circumvented by a new super highway. As our hero, the Mooncop, makes his daily rounds, his beat grows ever smaller, the population dwindles. A young girl runs away, a dog breaks off his leash, an automaton wanders off from the Museum of the Moon. Mooncop is equal parts funny and melancholy. capturing essential truths about humanity and making this a story of the past, present, and future, all in one. 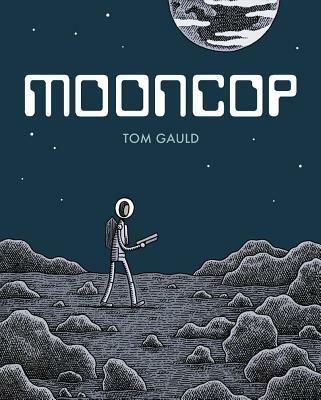 Like his Guardian and New Scientist strips, as well as his previous graphic novel, Goliath, Mooncop is told with Tom Gauld's distinctive, matter-of-fact storytelling and dry humor — an approach that has earned him fans around the world. Tom Gauld is a cartoonist and illustrator. He has weekly comic strips in The Guardian and New Scientist and his comics have been published in The New York Times and The Believer. In addition to his graphic novels Goliathand You're All Just Jealous of My Jetpack, he has designed a number of book covers. Gauld lives and works in London.